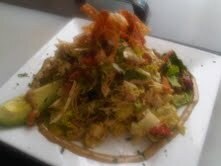 The best salad award goes to the Asian Chicken Salad at Jerry’s and Corner Cooks in Winnetka, IL. I swear this salad was made just for me. The combination of dates and goat cheese (I ask for extra) is enough to make me weak at the knees. Adding fresh avocado, tomatoes and crispy wonton strips gives the salad color and texture. Finally, top this mountain with shredded chicken and Jerry’s homemade peanut-lime salad dressing, and the next thing you know, you will have cleaned your plate. If you can’t make it to Jerry’s to try this masterpiece, making it at home is pretty easy. Just top romaine lettuce and cabbage with your favorite salad veggies. The wontons are key- Jerry’s are homemade but you can buy them pre-packaged at your local grocery store. As for the dressing, making your own peanut sauce will always taste better than something store bought. Go for a recipe that calls for a lot of lime and a little heat, adding more of both ingredients as you blend. Personally, I tend to double the amount of lime in my homemade peanut dressing, because who wouldn’t want more lime? Finding a good salad in Thailand is like trying to track down a needle in a haystack. Unless you are willing to pay exorbitant prices ( I am almost at that point), salad is just not something the Thai palate craves. Before Thailand, I had salad for dinner almost every night. In my mind, it is one of the most versatile side dishes; change the ingredients around and salad will compliment almost any main course. For the last six months, I have basically gone cold turkey (with a few exceptions). Needless to say, I find myself dreaming about salad more than I should. I love it too!! One is waiting for your first lunch out in april!! What was the name of the restaurant we went to on Michigan Ave up the escalator that had the salad with cornbread croutons? That and the one in Barcelona that for the life of me I cannot STILL not remember where it was or what it was called. Talk about goat cheese. Bandera… and yes, this salad is very similar and amazing! That night in spain is definitely unforgettable, even though I don’t remember a lot of it 🙂 We will have to get together soon and find a goat cheese salad!